Michael Jr: Are You Jumping From What to What? This post is from Joe Pulizzi’s weekly newsletter published on October 14, 2016. To receive Joe’s exclusive weekly messages in your inbox each Friday, visit our subscription page. In our last PNR: This Old Marketing podcast, Robert Rose and I talked about the failed McDonald’s “Channel Us” YouTube campaign targeting Millennials. The 12-month program, which included nine films and integrated a few YouTube stars, didn’t do much of anything for the brand. Long story short, Robert and I believe that McDonald’s focused not on content with purpose, but on simply creating a video for YouTube. Now, I’m not picking on McDonald’s here. Many companies of all sizes, including ours, have made this mistake, and it’s important to look at why the failure happened. I think my friend Michael Jr. has the answer. 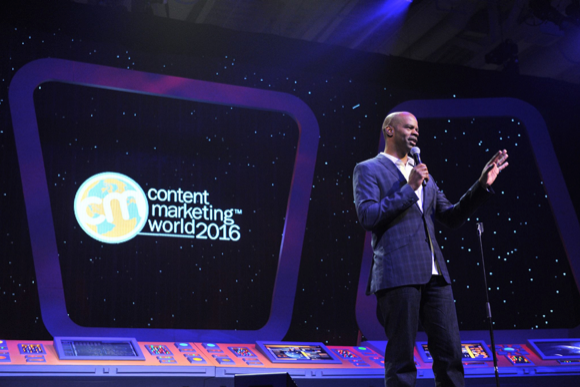 Michael Jr., an amazing comedian, was one of our keynotes for Content Marketing World 2016. He received the highest score for any keynote we’ve had over our six years doing Content Marketing World. I want to talk about some aspects of his keynote; but first, as a preview, here’s a five-minute snippet that is well worth the watch. I urge you to do so when you have a free second. Michael Jr.’s words explain a lot about the state of content marketing right now. So many companies are creating articles and podcasts and social media posts; but is there a clear why behind the ‘what’ they are creating? Sadly, most businesses don’t have this. They just run to the ‘what’ first. Well, are you? Do you know the “why” behind your content? Or are you jumping from article to podcast to video without truly understanding the purpose for creating it? Here’s what I ask of you: Right now, stop creating all the “whats” and really put some thought into your “why.” Find a “why” that has purpose for you as well as a deep purpose and meaning for your audience. Once you find that, all the “whats” will easily present themselves. Did you like Michael Jr’s message? What resonated most with you? Do you know of other inspiring and informative speakers? We’d love to hear what you have to say!